back to your landscape in late summer and into the fall months. from low growing border plants to stately background plantings that may reach six feet in height! Dahlias are summer blooming tubers that are generally only hardy in USDA zones 7-11.
and then cut back and dug each fall after the first killing frost. 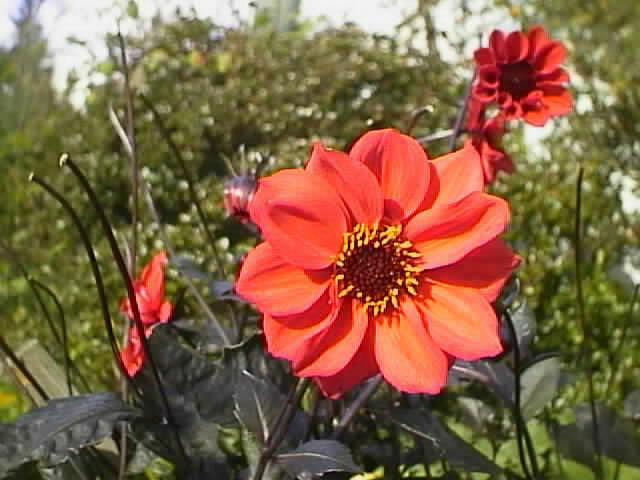 Dahlia plants grow and bloom best in full sun. well drained, slightly acidic soil with a pH of 6.2- 6.5. If your soil is heavy or clay, adding sand and peat moss will help to lighten it. Water established Dahlias thoroughly and deeply once a week. Water more frequently if it's very hot. before they begin to set buds using a water soluble, 'bloom' type fertilizer . has been wet and stormy, you may want to wait for a drying trend. Dig and prepare a 12 inch diameter by 12 inch deep planting hole. Mix a shovel full of compost, a handful of bone meal, and a little Dolomite lime to the soil that was removed. Fill the planting hole with the soil mixture until it is about six inches deep. with the eye pointing upward. which can result if it is added after the tuber has begun to grow. begins to emerge from the soil, gradually add more soil mix until the hole is entirely filled. Once your Dahlia attains sufficient height, secure it loosely to the stake. is supported approximately 24 inches below the eventual top of the plant. the same procedures you would for planting any other perennial plant. pinch back the new growth when your dahlia is about a foot high. If your goal is to produce massive sized flowers, remove all of the side buds at the end of each branch throughout the growing season. If you want your Dahlia to provide a continuous, extended flower show, you will need to remove the spent buds promptly. The tender new growth of a Dahlia is one of the favorite entrees of slugs and snails. Take the necessary precautions to protect your plants from these evil lawn prawns. If the identity of your Dahlia is important to you, be sure to add a tag to the stake at planting time. This will be an invaluable help when it is time to dig your tubers in the fall. For the finest cut flowers, cut them early in the day, when they first open. Change the water daily. Cut Dahlias will last from 5-7 days. 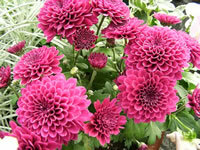 Generally, seed grown varieties of Dahlias are started as bedding plants and then treated as annual plants. They will produce tubers during their first year of growth which can be dug and replanted in the same way as larger Dahlias, but because of the ease of growing them from seed, most gardeners prefer to discard the old plants and start fresh the following year. Growing dwarf Dahlias from seed can also reward you with surprising new hybrid varieties and colors. In warm regions of the country, Dahlia seeds can be sown directly into the garden where they will grow. 6-8 weeks prior to planting outdoors. of 70°-85° until germination which takes from 7-21 days. Keep the soil evenly moist, but never soggy. carefully thin and transplant them into individual 4" pots. Grow them on in bright light, but not direct sunlight until it is time to move them into the garden. Some gardeners choose to leave their Dahlia tubers in the ground over the winter. of 6"-12" inches of mulch to the planting area before the ground freezes. The best plan is to dig the tubers and store them in a cool, dry place for the winter. Prior to digging, your Dahlias will need about a week to produce new sprouts on the tuber. or will occur naturally when the majority of the plant has died back due to frost. Dahlia tubers are easiest to divide if they are harvested after this one week period. Use a gentle spray from your hose to clean and remove the remaining soil from the clump. then store the individual tubers or store the clump and do your dividing in the spring. which appears at the point where the tuber connects to the main stalk. Place the tubers in a bed of sawdust or vermiculite, inside a cardboard or wooden box. Store them in a dry area where the temperature will remain at about 40 degrees F.
that have been hybridized throughout the years. 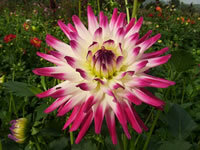 Dahlia plants range in height from as low as 12 inches to as tall as 6-8 feet. The flowers can be as small as 2 inches or up to a foot in diameter. by pruning, disbudding and ultimately forcing the plant to create a few single, gigantic blooms. experiences with you regarding their successes, failures and favorites. They may even be willing to share a few tubers with you. you will have a much better idea of which types of Dahlias to grow in subsequent years.